I’m always on the go! 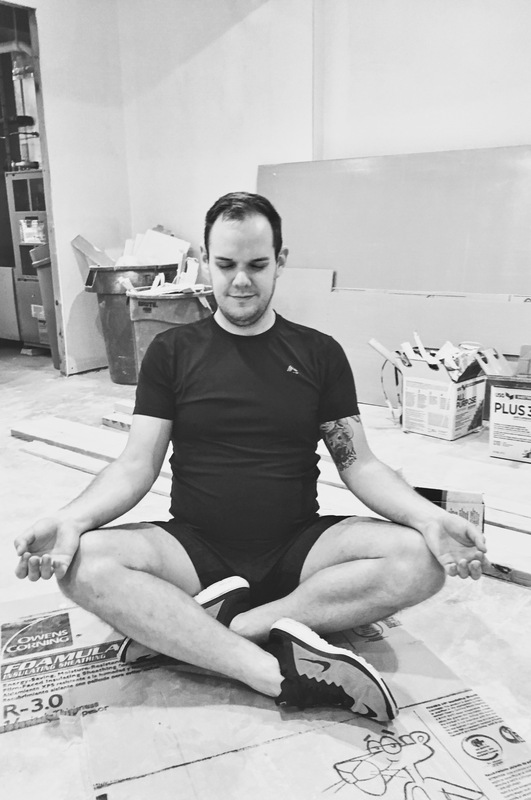 As you can see in the first picture, my house is being remodeled and I’m always trying to find inventive ways to carve out pieces of quiet for myself. But honestly, I like it that way because I get to interact with and learn from so many different people every week. I’m so thankful for the chance to follow my dreams and live such a full life that I almost feel obligated to take on every opportunity and obstacle head on, knowing the universe has my back. I know it sounds kind of “woo-woo” but a while back I decided to look past my fear and anxiety, because they certainly weren’t working for me, and dove head- first into the journey of the natural, divine flow around me. And it has not stopped loving me back! To find that love inside yourself and then share it back into the world around you is a process that continues to unfold throughout our lives. There’s no quick fix. There’s no miracle. But there are flashes of insight and lessons that we learn along the way that catapult us into the next chapter of diving deeper and understanding ourselves. For me, one of those lessons, as hard as it is to really apply consistently, was to step back out of the fire and make time to heal and nourish my body. There’s only so much gas in the tank, you know? As we creep into the sweltering heat and suffocating humidity, that natural push back from our environment is a helpful reminder to slow down and savor the sweetness of it all. The longer days, the warmer nights, the plethora of fun activities beckoning for you to join, all take time and energy. If we don’t make space in the chaos to recover and reenergize, we won’t have the chutzpah to get it all accomplished. There’s so much to see and so much to do, but we have to stay strong and present for any of it to really matter. 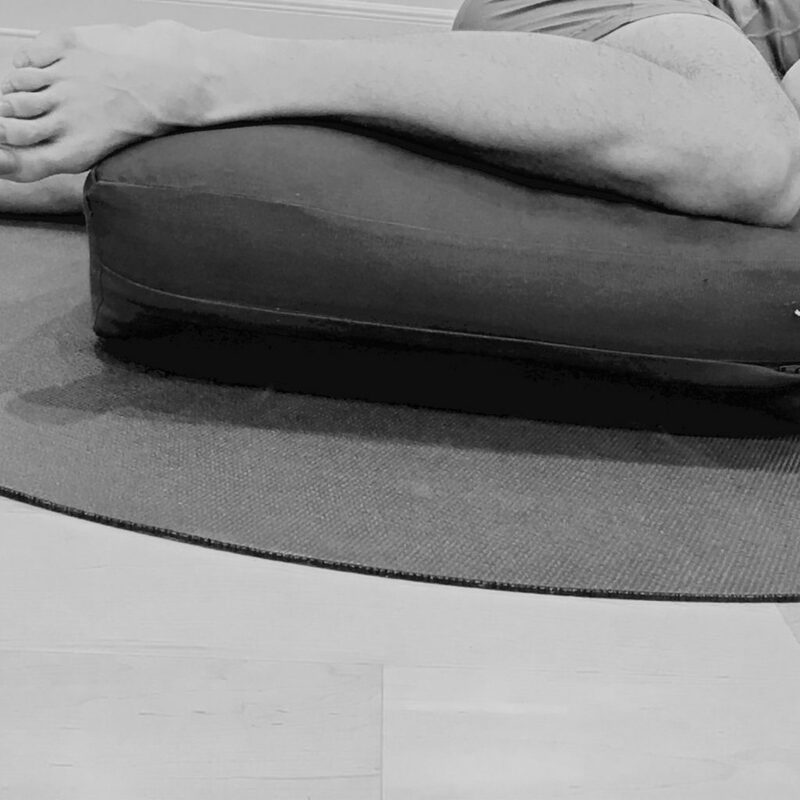 Restorative yoga is the perfect accompaniment to an otherwise active practice and lifestyle. It’s quite literally the yin to the yang. The hardest part for most of us is to sit still and focus on our breath. There are a million other thoughts and memories, sensations and feelings that lure us away from the smooth, easy flow of our breath; and they especially seem to creep up when we hold our bodies still. Trust me, you won’t die if you don’t itch that itch, or move the hair out of your face, or adjust your props for the hundredth time. You can continue to harness the power inside, this time strengthening your mind instead of your body. The following sequence is best at the end of the day, allowing you to unwind and relax before a long night of sleep and healing. Each pose is held for 5 minutes, each side if necessary, and you should aim to stay as still as possible. Especially if you’re newer to the slower practice, you can give your active mind something do by counting your breath or chanting a simple mantra. My favorite is SO HUM (simply, I AM). Enter and exit the poses slowly and methodically to allow your body to adjust to the changes and keep the space you’ve just made. 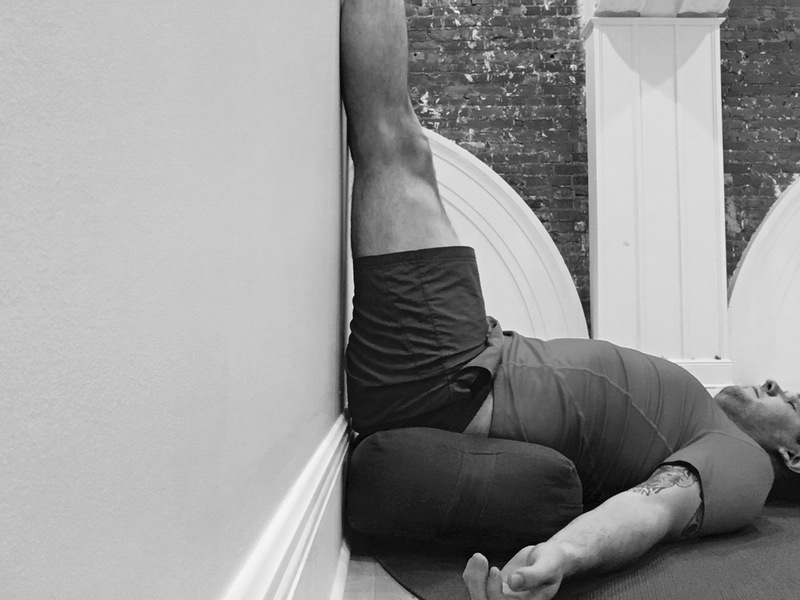 The idea in the poses is to gently and completely surrender into the support of your props, the wall and the floor to calm your nervous system and slow your mind. In the long run, restorative yoga can lead to reduced blood pressure, reduced inflammation and an overall sense of a balance and compassion. Your first pose is prone savasana. 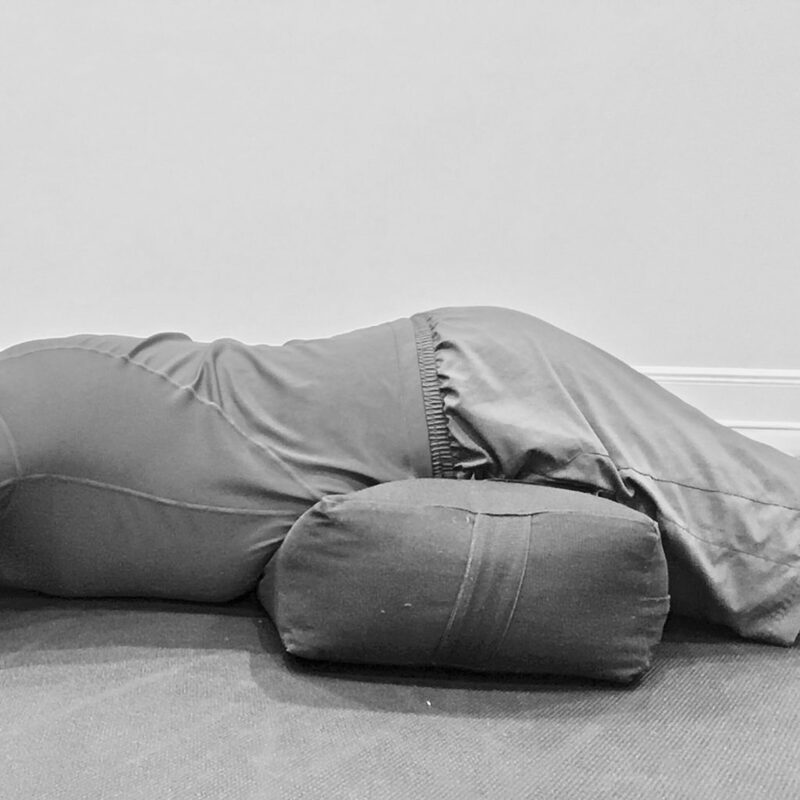 We usually practice this pose at the end of class, but turning face-down is the perfect way to start the journey of looking deeper, past the thoughts and sensations, into the depth of our breath and our bodies. This pose is excellent for easing back pain and is especially helpful if you imagine your breath moving all the way down into your hips and expanding them out and away from one another. 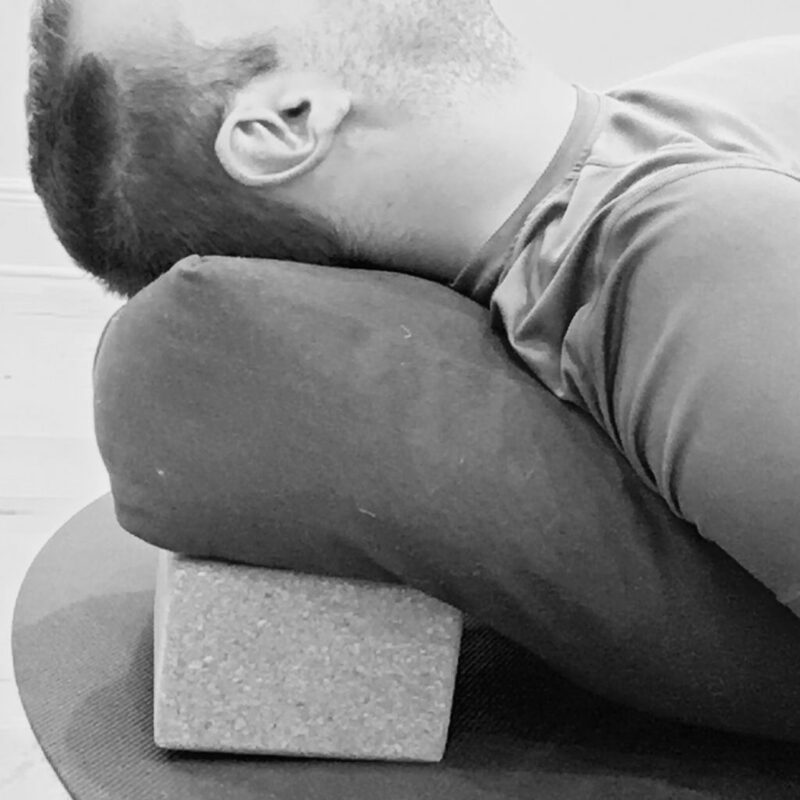 The bolster or blanket is placed right across the top of your hips and low belly and your head can be resting on your hands or a pillow. 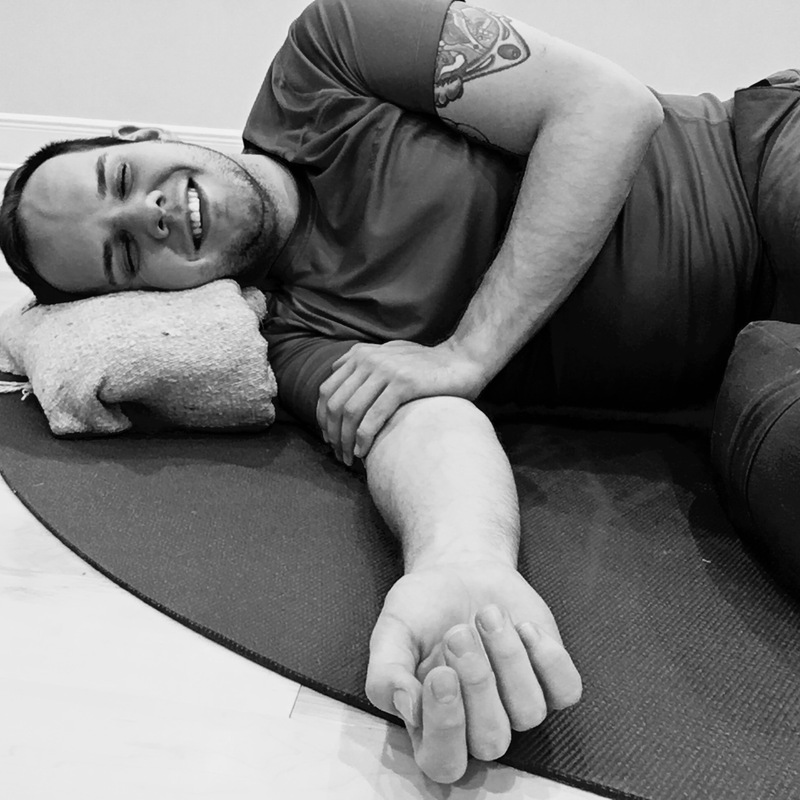 Your next pose is lying on your side with a bolster or a a few blankets to support your leg as you rest down. Another blanket or pillow can be used to support your head if your arm isn’t giving you adequate support. This pose is especially good for easing low-back pain and finding balance in the spine. Use as much support as you need under the leg and head to assure you can totally surrender into the pose. NO effort whatsoever. After resting on both sides, come back to your first side and work the bolster or blankets up under the top side of your hip. Again a blanket or pillow can support your head. The legs can be stacked or staggered, extended or bent. This is all about what works best for you to completely let the tension melt away. The top arm can also come over your ear for even more space in the top side body. Focus on the breath moving in all parts of your abdomen: belly, back, sides and chest, with a full, even expansion and contraction. The next pose is one of my favorites. Build yourself a ramp by placing a bolster or a couple of pillows on a block and rest back. Additional support can be used for your neck or arms if you feel like your straining to completely let go. This is already a perfect pose to open up your chest and shoulders and encourage deep, rhythmic breathing. Your legs here can be straight or bent, whichever feels best on your back. 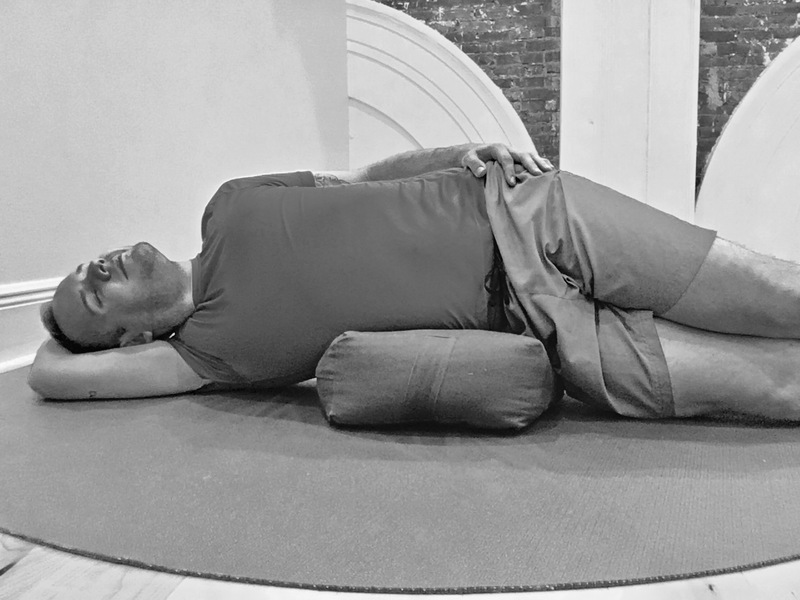 To add even more opening to the pose, roll up a blanket and put it over your feet, under your ankles and out under your shins; completely supporting your legs as your hips creep open. This pose allows you to open up into the support of the props, and really allow the breath to move nice and deep. The more oxygen you draw in, the safer and calmer your body feels, allowing you to relax even more. Our final pose is sending your legs up the wall, with your hips as close tot he wall as your hamstrings allow. This pose can also be done with the support of a bolster or pillow under your low back to really lengthen out your low back and soften your belly. I can’t say it enough, its all about making space for deeper, more relaxing breaths. After these 35 minutes or so, you should feel more calm and most importantly, more connected to the rhythm of your body and mind. I personally suggest moving through this gentle series at least once a week. Even picking one or two of these poses in the morning or afternoon, can do wonders for keeping you grounded and centered throughout the day. In short, step back, reflect, connect deeper, and SLOW DOWN. Let the sweetness of life and the light of summer soak in as you settle into the rhythm of life. Listen to those messages that come from inside and build the trust with yourself that you are worthy of this time to disconnect from the world so you can connect to yourself. That warrior spirit is always alive inside you, but we have to take time to heal and refill to make it to the end. Take care of yourself, friends! This is so cool! Great ideas for staying in the flow of life.